I've been blogging here for several years, but only consistently for the last three years or so. While I know I have a ton to improve on over the years to come, there are several bloggers that inspire me and I always enjoy engaging with. 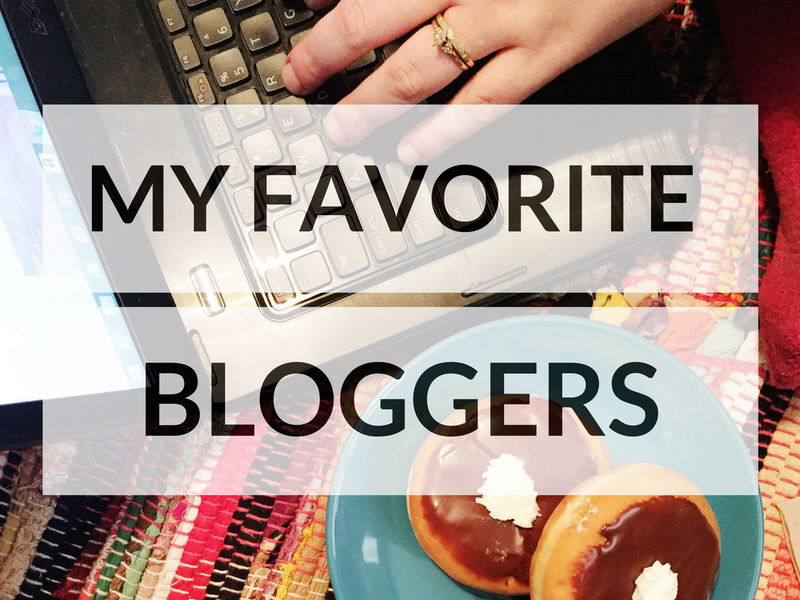 I wanted to share five of my favorite bloggers today, so maybe they can become some of your favorites, too! Emelia @ Dream Big and Buy the Shoes: Emelia is so kind and encouraging. Her posts are always guaranteed to brighten your day. She got married pretty recently, and you will 100% cry over her wedding pictures! You can follow her on Facebook, Twitter, Instagram, or Bloglovin'. Dara @ Peonies and Bees: Dara is another recent newlywed, and also has beautiful wedding posts popping up that will give you all the feels. She's always reading great books, is currently renovating her home, and has a pretty killer set of financial tips surfacing on her blog. You can follow her on Twitter, Instagram, and Bloglovin'. Macy @ To Travel and Beyond: Macy is another kind soul who will always inspire you to do your best and cheer you on towards your goals. Her and her husband are freaking adorable (go back to all her wedding posts too, so sweet! ), and they travel all over the world. Follow along with her on Twitter, Instagram, Facebook, and Bloglovin'. Kasi @ Birch Juice: Kasi hails from Canada, then moved to Tennessee, and now lives in New York. She has a great taste when it comes to what to read next - which she talks about on her blog and on YouTube channel. Plus, she always has the coolest glasses! Follow her via Twitter, Instagram, and Bloglovin'. Kaelah @ This Charming Life: (aka Honeybee in the City aka The Clueless Girl's Guide). Kaelah is basically the original blogger I followed before I knew about things like Bloglovin' or blogger communities. She has always been so pretty and has two adorable boys (and adorable pets). Make sure to check out her Things I Love Thursday (TILT) posts, because they're always so fun and encouraging! You can follow her on Twitter, Facebook, Instagram, and Bloglovin'. What are some your favorite blogs to visit? Leave the links below, so I can check them out! To join the link-up, make sure to add your link at the site below, and don't forget to link back to me and your other hosts! Click here to enter the giveaway! The #LoveBlog2017 giveaway starts 02/01/2017 and runs through 02/28/2017. While we love our international readers, this is limited to US residents only due to legal restrictions. To learn more about all the sponsors, check out Belle Brita all month long! Brita is the pink and sparkly personality behind the Christian feminist lifestyle blog, Belle Brita. While her first love will always be Paris, she lives happily with her husband Daniel Fleck in the Atlanta area. Charlene is a 20-something wife and fur mama living in Ohio. She uses her blog, Enduring All Things, to inspire young wives to keep God first and their husbands second in everything they do. Well isn't this the sweetest way to start my day?! Thank you so so much for your kind words Kayla! You are such a gem and I'm so happy we found each other in blogging- you always make my day. So happy to be in such great company with these other bloggers too. Hope you have a great week! I'm glad I could help start your day out just right! :) I always enjoy interacting with you. Ooh I found some new blogs I'll have to look into! Thanks so much for the new recommendations! Of course! I hope you enjoy them. I can't wait to check out these blogs! P.S. You used the inlinkz code for the 28th, not the 27th. How embarrassing! I'll make sure to fix that. I definitely hope that you find some new blogs that you love! I love Emelia! I can't wait to check out your other favorite bloggers! Yes! She's the sweetest. I hope you enjoy the other bloggers, too!